If your car’s scratched and dented bumpers reveal a long history of you accidentally backing into things, you don’t necessarily need to buy a new vehicle just to get a fancy collision warning system. If you have a smartphone, and can use a screwdriver, you can easily install this license plate cover that serves as an extra pair of eyes for you when reversing. 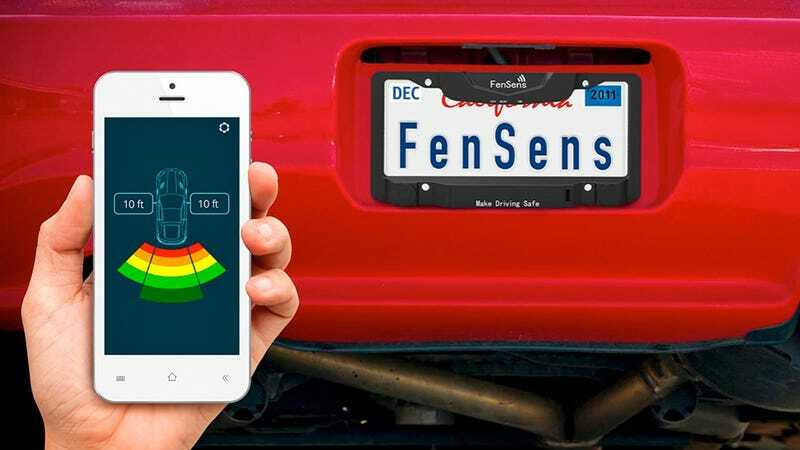 The FenSens Fender Defender isn’t the first aftermarket collision warning system, but what sets it apart from the competition is how easy it can be installed on almost any vehicle with a license plate. Just remove the four screws already holding your vehicle’s license plate in place, put the Fender Defender atop the plate, and then re-attach it to your car. Instead of then having to mount an LCD display to your dashboard, the Fender Defender communicates with an iOS or Android app over Bluetooth to provide warnings about impending collisions. Four ultrasonic sensors with a range of about 10 feet keep an eye on what’s directly behind your car, and if you’re getting close to something, visible and audible warnings will automatically let you know. Because the Fender Defender, which is available for pre-order for about $150, is reliant on a smartphone, there are no wires to deal with during installation. Not even power, since it has its own rechargeable battery good for about five months of use. The downside is that you’ll have to remember to recharge it every so often, but that’s a technical challenge most of us already successfully deal with every single night with our phones.